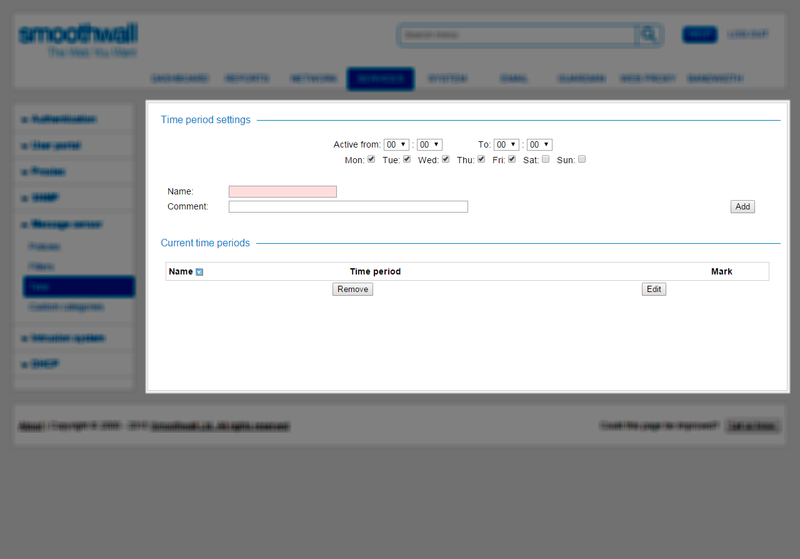 You can configure the Smoothwall to apply policies at certain times of the day, or days of the week. 1. Go to Services > Message censor > Time. • Active from – to — From the drop-down lists, set the time period. Select the weekdays when the time period applies. • Name — Enter a name for the time period. • Comment — Optionally, enter a description of the time period. 3. Click Add. The Smoothwall creates the time period and makes it available for selection on the Services > Message censor > Policies page. 1. Go to the Services > Message censor > Time page. 2. In the Current time periods area, select the time and click Edit. 3. In the Time period settings, edit the settings. When finished, click Add to save your changes. 2. In the Current time periods area, select the period(s) and click Remove.